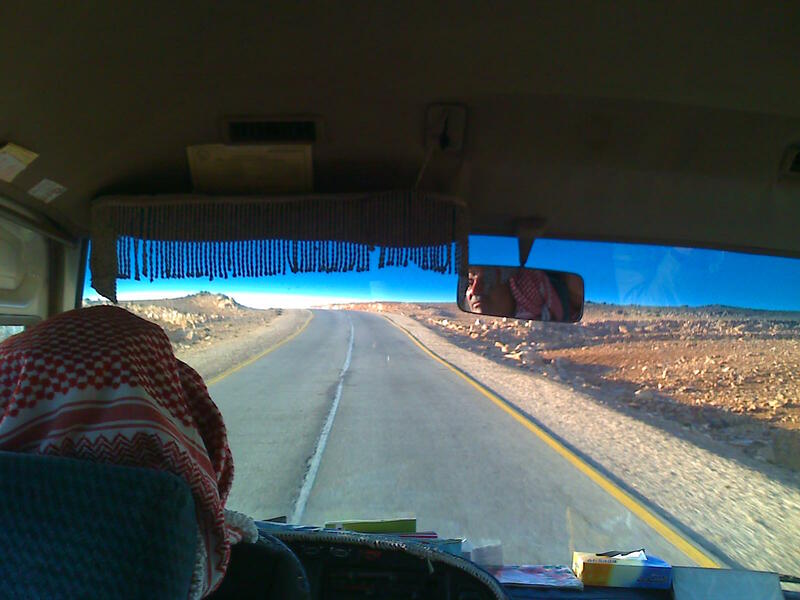 I had to wake up early for this group tour I booked with the manager of the hotel in Wadi Moussa (the town Petra is in) This meant getting up very early, the calls from the neighbouring mosque took care of that, but not so loud or abruptly this time. I came down at just after 6am and remembered I could get some breakfast for leaving, apparently breakfast in Jordan is quite simple affair, pita bread with jam or some foil triangles of cheese. Had a couple of these and was half way through some coffee then heard a beep from outside, my bus tour was here dead on time at 6.30. This is where a very stressful morning came. I realised to my horror I had spent most of the money in Jordan on the long taxi ride, admission to the park and food. Here the tour guides would obviously expecting payment before we leave town and there were no ATM machines once we left Wadi Moussa. We stopped in a road with two banks opposite. Here they let me out and I drew out some money, the ATMs have the instructions in Arabic and a selection of main European languages as well. This machine asked some strange questions asking me if my bank account was a savings, checking or some other account, I pressed one of these before correctly two day ago, but I didn’t really know which of these is appropriate to my account, anyway it spat out my card, and second attempt was the same. The different bank over the road had a machine that gave me the same result and refused a withdraw. I had to tell the young Arab man on the bus I would have to cancel my trip as there was no way of paying and I couldn’t use plastic to pay for the tour (about 35 Dinars I think, quite good value for a whole day’s exploring, staying overnight and getting food) so there he told me I could pay with my shekels and after giving me a figure I didn’t have time to think but knew it was a pretty lousy exchange rate, I decided to stay put in the bus and go with the trip. A bit further on we were told we would get to a checkpoint where would need to pay for access into the park. Before getting there I had a phone call, not on my phone as I didn’t have roaming enabled to use my phone on JO networks, but the driver’s Nokia phone which reeked of cigarettes which a voice of someone I have never met told me (but strangely not the other travellers) that I had to tell the border guards I had come from suchandsuch hotel, I replied and told him I was from a different hotel, but the voice repeated that I had to tell them this exactly, as it implied I had to be a bit dishonest to the security guards at the Wadi Rum border, this made me feel really uncomfortable. I really was not enjoying this trip so far, not planning in advance in having enough cash in Dinars, tour guides who were asking me to tell lies, more oddities were yet to come. At the border, which was a fairly relaxed affair, seeing as I was going to a national park not between two political authorities, the guards asked me where myself and the other people on the trip where we were from, I just said I was from that hotel, seeing as I could not remember the name of either my real hotel and the one they tour people wanted me to say. They told me I needed to pay 2 dinars, this was not mentioned about extra fees with the tour, but it was not much money so I didn’t care too much. 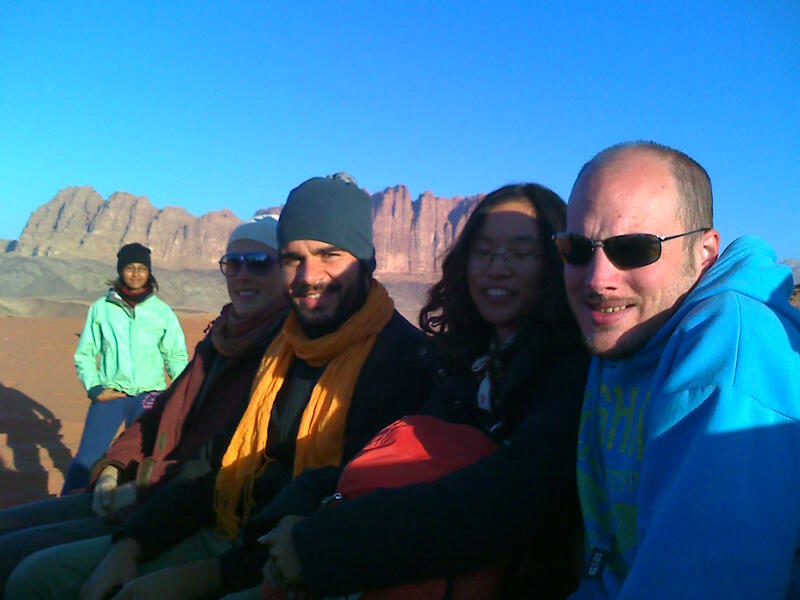 The trip was tour around Wadi Rum a famous desert national park towards the south of the country, not to far away from the border with Israel. This meant my journey back to the border would be much easier and cheaper, as not requiring only and costly taxi ride. We got off the minibus (which was a Toyota, I didn’t know they do vehicles of this type) at a small village with a couple of dozen houses that looked a bit scruffy looking, and got to office where Zedan the tall Arab man who is the boss of the tour company. We just got a chance to have some Arab tea and have a chat. The other people on the trip were two Japanese men, two Swedish men, a couple who were Mexican and Spanish, a Korean girl, a Brazilian chap and a few others. Another good chance to share stories of what we were doing in the middle east. Seeing as there is lots of stories on the news about Jap motor giant Toyota’s reliability being tainted due to various different issues with sticking accelerator pedals or software bugs causing brakes not to work if hitting a speed ramp, it seems Jordan is where aging Toyotas go to retire. This is the quality automobile that was used for our trip. There appears to be no keys, I don’t think the owner locks it, probably doesn’t matter as the boss of the group leaves outside his office which is in a small village in the south with only about 20-30 houses in between two mountains. The young chap who is our tour driver has to touch two pieces of cable under the steering column. The car has some of the plastic rim of the steering wheel come away and fixed with insulation tape, various other bits like all three mirrors and one of the brake lights are missing, one of the wiper arms is completely absent, the other has a sharp metal prong which has already scored a curved scratch over the windscreen, I also noticed part way through the desert that the fuel gauge showed empty, I asked him that I hoped that it doesn’t work, and he assured me it didn’t! 🙂 The bodywork looks quite decent until I open the back door and can see rust holes along the rear wheel arch with a 2mm gap where I can see the tyres. There is also strangely no licence plates on this or the other vehicle another older Toyota of possible late 1970s origin, we did go past a police car and they didn’t bat an eyelid. I would say judging by the black square on the doors it looks like this Toyota Landcruiser could of once owned by the UN, a recent test drive of Top Gear of the latest 2009 model mentions the UN are Toyota’s biggest client for this model car, but the man said it used to belong to the Jordanian government. Not long after we stopped at a small shop in the middle of nowhere on a desert highway to get stuff for lunch, which after carefully counting about 3 dinars (I worked out I needed the other remaining 20 for my taxi home) got me some salty biscuits and some extra water. 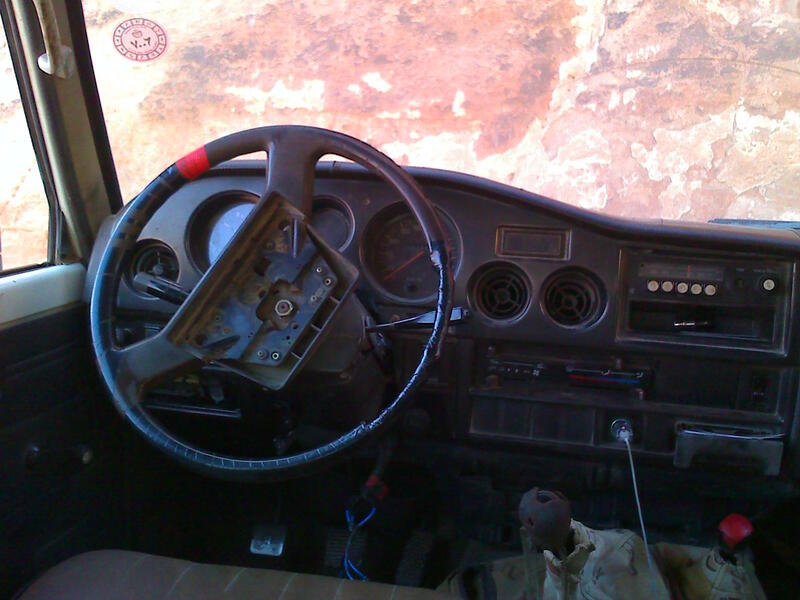 Pics from us in the other truck which was swapped over a bit later. 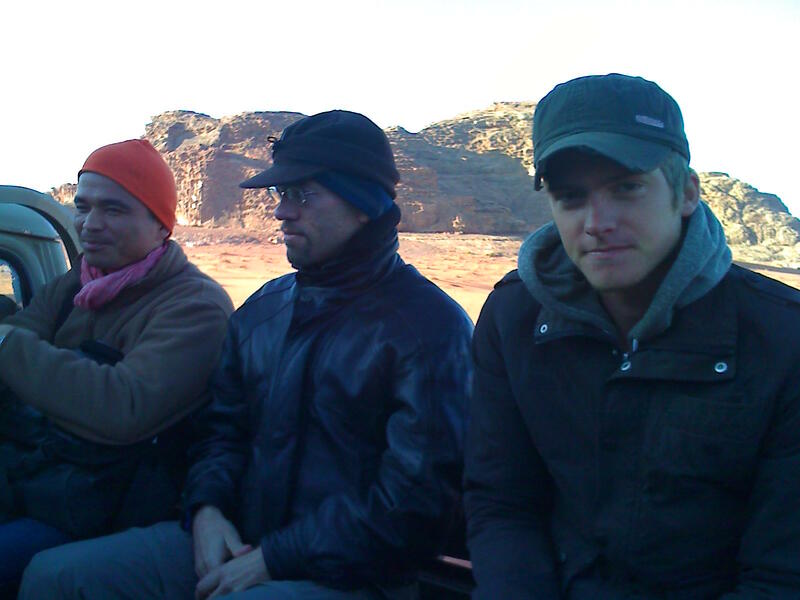 Next, roughing it in a Bedouin camp in a desert in December….